There are very few baseball players whose trading cards can be included in collections that span over 100 years. Casey Stengel happens to be one such player and the following list aims top help guide collectors though more than a century's worth of cards to build a collection that is full of variety, value, and exemplifies one of the most unique personalities that's ever played the game. Although he was born in Kansas City, and his nickname "Casey" is a version of "K.C.," he will be forever connected to New York City. He is the only person to have been a member of all four baseball teams that have inhabited the Big Apple. Over his time as an outfielder from 1912 to 1925, he played for both the Brooklyn Dodgers and New York Giants and he later managed the Dodgers, New York Yankees and the New York Mets. 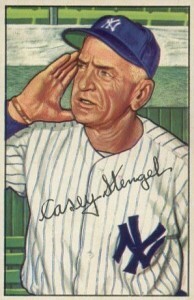 Shop for Casey Stengel cards on eBay. While Stengel does have a few hard-to-find and expensive tobacco cards from his playing days, the main focus for many collectors are Stengel's cards from his days managing the Yankees. 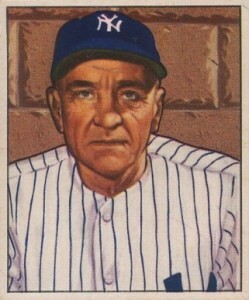 He oversaw seven Yankee championship teams, including five titles in a row from 1949 to 1953, making his manager cards the most sought after in the sport. Although Stengel's original tobacco cards are difficult to own, a few modern sets offer cards featuring Stengel during his playing days. You can find cards in the 1975 Great Plains Greats set that includes members of the Baseball Hall of Fame and was issued by an Iowa-based window company, as well as a Shakey's Pizza Hall of Fame set from the following year. Both cards can be found for a few dollars each. 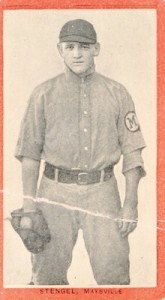 Another theme that runs through modern Stengel cards is the use of unusual photograph, including Casey mugging for the camera and making funny facial expressions. In 2002 Upper Deck SP, you can even find a card with Stengel wearing a graduation cap and fully embracing his role as "The Old Perfessor." The following list will help you separate the reprints, comedic, and oddball cards of Stengel's hobby legacy and help you focus on the cream of the cardboard crop. Casey Stengel has a famous mini card in one the largest tobacco card set ever created, 1910 T210 Old Mill. When I say largest, I am referring only to checklist size as you rarely find original examples and collectors should be wary of reprints. Stengel's card was issued in Series 6 of the set (the cards themselves weren't individually numbered) and is a minor league card from his time in the Blue Grass League with the Maysville Rivermen (you'll notice the team's "M" logo on his left sleeve). I would have placed this card higher on the list had it been more readily available to the average collector. 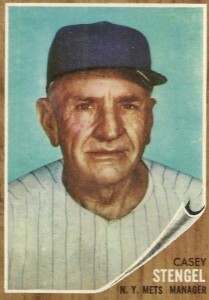 Casey's 1962 Topps cards finds him as the first-year coach of the expansion New York Mets. As was often the custom when a player or manager changed teams, Topps reused the image from Stengel's 1960 Topps card and airbrushed the logo off of his Yankees cap. Because of the printing issue that famously plagued the 1962 Topps set, you can find examples of his card with a darker blue background and a cap that looks more purple. This look makes Stengel appear as though he was sporting an Arizona Diamondbacks jersey from the late 1990s. Casey Stengel passed away in 1975, long before the era of certified baseball card autographs. While you can find some cut autographs now and again, the jersey relic card is a much more obtainable piece a memorabilia for collectors. 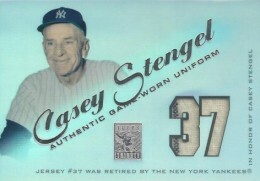 Stengel's #37 uniform number was retired by both the Yankees and Mets and so when Topps included Stengel jersey cards in 2001 Tribute, they included relics from each team and gave both sides of this rivalry a card to chase. Has there ever been a card that better personified Stengel than his 1965 Topps card? He earned the nickname "The Old Perfessor" because of his ability to provide a lecture on any baseball topic presented at a moment's notice. You can just hear him expounding on this and that topic the day this photo was taken and he probably continued long after the cameraman had gone home. 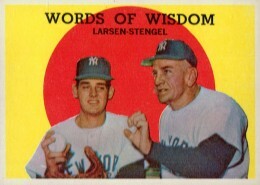 Casey Stengel shares his 1959 Topps card with Don Larsen who famously tossed a perfect game in the 1956 World Series under Stengel's tutelage. This is a personal favorite of mine as it seems that Stengel is demonstrating to Larsen the technique of throwing a knuckleball. 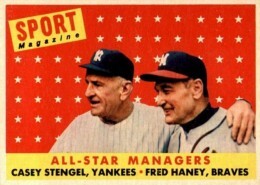 While Stengel had several Bowman cards from the early 1950s, he wouldn't make his Topps debut until the 1958 set where he shared the card with Milwaukee Braves manager Fred Haney. Haney's team bested the Yankees the previous year in the 1957 World Series. While 1953 Bowman Color gets most of the attention, Bowman also released a small black-and-white series of baseball cards in 1953 as well. The coloring (or lack thereof) gives some of the cards a sense of gravity that might have been lost in a colorized set. 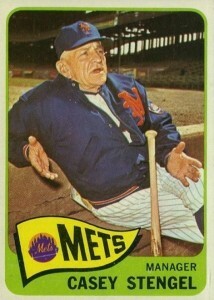 This is especially true in the case of Casey Stengel's card as he looks like a larger-than-life character. In 1953, after five consecutive World Series championships, he was. Is Casey signalling a sign to the catcher or maybe a runner on base? It's hard to imagine the look on his face being one of frustration as the Yankees had won four consecutive World Series titles by 1952. Simply put, this card is beautifully painted and shows a manager at the top of his game. 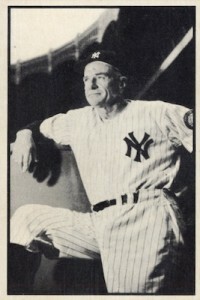 While Stengel is known for his coaching stints with the Yankees and Mets, Stengel also managed the Boston Braves (the team was also called the Boston Bees during his tenure) from 1938 to 1943. 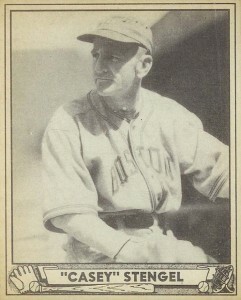 While Stengel's standard Play Ball card from 1940 can be found for a few hundred dollars, his card was also included in colorized tests in preparation for the 1941 Play Ball set, which was in color. Those rare test cards can reach several thousand dollars at auction. It's not his rookie card, nor is it even his first card as a manager, but Stengel's 1950 Bowman card takes the first spot on this list. This is Stengel's first card featuring him as Yankee's manager and so it commands a lot of attention and value from a huge fan base. It is also nearly identical to his 1951 Bowman card, which simply changed the dimensions of the card and added a name plate.